It was just last week that guest conductor Nikolaj Znaider and Ottawa’s National Arts Centre Orchestra (NACO) led a richly vibrant performance of Dvorák’s Symphony No. 6. This week lighting has struck a second time. It was the debut here of Venezuelan maestro Rafael Payare leading Dvorák’s wonderful Symphony No. 8, composed in the final months of 1889 and melding the composer’s unique sensibility with parallels to Bruckner, Brahms and Tchaikovsky. The work is almost a summation of 19th century Romantic symphonic writing at its apogee, an experience of joyous creativity which was brought to life by the youthful Mr. Payare (born 1980) with a sleek flashy virtuosity that was often awesome. With a mega-mop of hair and slight, kinetic build, his stage manner is a cross between Leopold Stokowski and Prince (which won’t do any harm for his PR people). What’s important is that Payare knows how to take charge of an orchestra and get what he wants. In particular NACO’s brass section (albeit with extra musicians for the Dvorák) has not sounded this good in a long time. The Symphony opens unassumingly, very much as Brahms commenced such works; there are quiet strings then a recurring piccolo motif. Three primary melodies soon appear and the development, with its sudden, sometimes harsh contrasts, evokes Bruckner and even Beethoven. The second movement (Adagio) is among Dvorák’s finest creations, again featuring piccolo at the start, then a melancholy theme with Gypsy touches and a foreshadowing of the Arabian Dance from Tchaikovsky’s The Nutcracker, composed a couple of years later. The Adagio continues with dialogue among the orchestra’s various sections, and a fine first desk solo from concertmaster Yosuke Kawasaki. The Symphony’s third movement, with its gossamer, waltz-like opening, may be its best known, featuring strings then light winds, a middle section, and a busy coda which brings it to a bravura, champagne-toast conclusion, leading directly to the trumpet salute which begins the final movement. Here, Dvorák effectively looks back to the earlier movements and creates a vivid set of variations, again relishing texture – trumpets at one point seemingly on loan from Tchaikovsky’s Symphony No. 4 – dialogue, and further contrasts in mood and energy. It’s known Dvorák labored long and hard to finish this work, but his effort paid off and the Symphony No. 8’s finale is characterized by ongoing organic bravura and, eventually, a brilliant and slightly faster coda which signals listeners that the work ends soon – but that we’ll all want more. Conductor Payare handed the work’s complexities with precocious assurance and the result was an immediate standing ovation, as well as very conspicuous approval from the players on stage. Overall he gets a big sound from NACO, though it was never harsh or forced. He cajoles genuine pianissimos when needed though clearly favors a rich, warmly frothy sound. The concert’s first half, while not at the level of the Dvorák, was always excellent, with tight precise ambience during Brahms’ Tragic Overture, then Mozart’s Violin Concerto No. 5 with UK-born guest soloist Nicola Benedetti, returning to NACO since her debut here in 2010. At 28, her career and artistry still are in the early stages though she’s now well established with DECCA Records. Benedetti’s playing of the Mozart Concerto had many lovely moments, though didn’t project as well as other violinists who have performed here of late, even with the ensemble pared down to around 35 players. There was a sameness to her playing overall, and not the richness one would expect from a 1717 Gariel Stradivarius instrument. 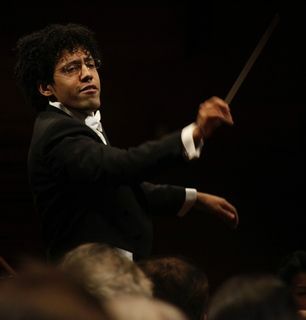 Conductor Rafael Payare did an excellent job of keeping the performance honed and unified.